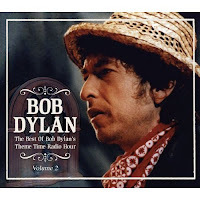 The folks who brought you The Best of Bob Dylan's Theme Time Radio Hour are back again with Volume 2. Like the first edition, the 2-CD set includes 52 cuts (track listing below), relying heavily on out-of-copyright (at least in Europe) selections. Again, as with the first edition, no Dylanesque commentary or TTRH material, simply tracks that have been played on the show.